Yesterday I had a big project I needed to do before the rains hit our area. I was able to get it done and had time before it started rain to get a few clicks in. I decided to try to get a shot of the Hummingbirds feeding on the Jewelweed out back of our house. I found a little spot along the fence line where I could be partially hidden and stood there and waited. And waited. And waited some more.I could hear the Hummingbirds chattering away behind me so I knew they would eventually make around but I was getting attacked by several types of flying insects and was not sure how long I could hold out. After the second fly-by of a very large wasp I decided it was time to go but really wanted to get something for my efforts. I knew if I moved quickly the Hummingbirds behind me would scatters so to minimize that possibility I pivoted around without moving my feet. I could hear the buzz of wings of the Hummingbirds as they moved about and one of the birds turned and came towards me. 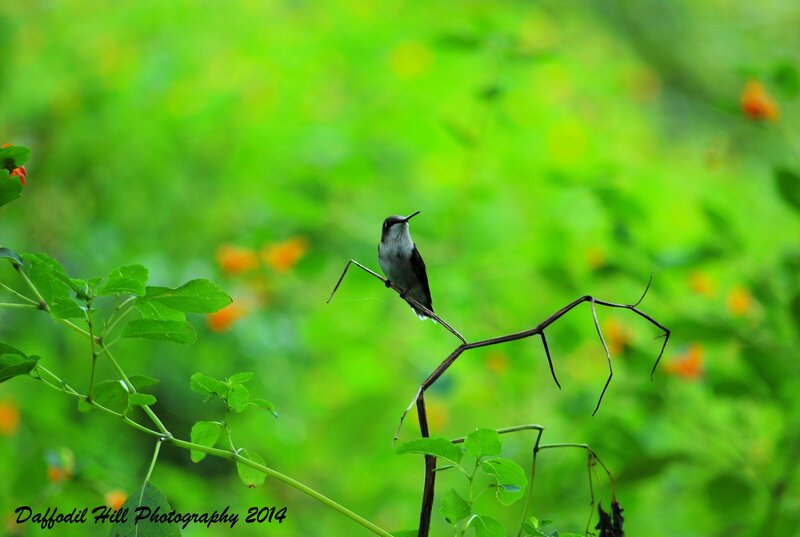 It landed on a branch not far from me, checking me out as it also keep an eye out for the other Hummingbirds. As it was looking up I carefully lifted my camera and snapped away. This shot, and two in the arm by a thorn-bush I did not know was there, is what I got for my effort. I especially love the background on this shot.. wish I could have a background like this on all my shots. Great photo! Have a great weekend. Thanks! I just checked out some of your captures and I think you have awesome backgrounds too. I like hummingbirds. Like your pictures, too.